PAINT!!! It was time to paint everything the craft room. I primed it all and used the paint Sandra recommended from Sherwin Williams. This was an easy choice for me because my whole house is painted in Sherwin Williams so I simply matched all of my trim paint for my cabinets in semi-gloss. It is all coming together beautifully! I hand painted all of the cabinets. It took a long time but I don’t have a sprayer and didn’t want to buy one. I was able to get a really nice finish even though it is all brushed and rolled. Patience is key. I added a self-leveling agent to the paint and it turned out beautiful. When I was building I was using different types of wood for different things. The cabinets are made out of Maple. Some of the face-frames are made with Pine and some with Poplar. The toe kick is made with another. Then all of the nail holes are filled with putty. It made me wonder how it was all going to turn out. Once I had the primer on it all became cohesive and took on a whole new look. It made me so excited to be able to see what it was going to look like all white. I opted to leave the card catalogs library brown. I like them like that and they add interest to the space. After finishing the priming and painting the next step was to build the drawers. 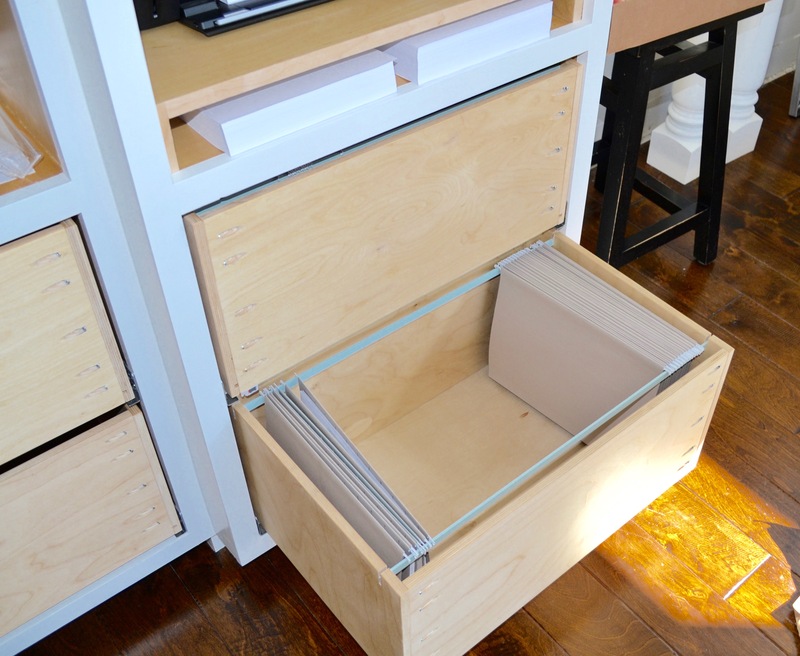 Never built a drawer in my life! At this point I am flying through the decisions and planning all by myself. I checked in with Sandra every week but the training wheels had finally been removed and she was just back there cheering me on. I ordered all of the drawer glides but they sent me the wrong size. So, I had to ship them all back and wait for the new size to arrive. So here they are, pictured above, beautifully stacked up. I was so proud of them. They are pretty much perfect! Woo hoo!!! The wood that you see them all stacked upon is what will be my countertops that I have chosen to make. But that is for another day. While I was waiting for the correct glides I decided it was time to build the peninsula. I had ordered some really chunky 5″ x 5″ table legs online and they were exactly what I wanted except for the height. I had to cut them down with my new miter saw (because, of course, it too was garbage not helpful). It was a challenge but I am used to challenges now. I cut, sanded, primed and pained the legs. Then I installed an apron using pocket holes and screws. The apron here is being constructed with Poplar and attached using pocket screws. BONUS INFO: One night I realized that it would be cold soon. As the desperation kicked in and I became delusional from late nights working on this room, I thought it would be a good idea to go to my friend’s house at 10:00 at night. I asked to use her hack saw and vice because for some reason they are the only tools I now did not own. Willingly, I sat on a lawn mower (because it was blocking the work table), in the dark, with only a shop light and cut whatever it was I so desperately need to cut at 10 p.m. Some call it crazy, I call it determination!